I didn’t get to fly to Annie’s hometown for our ultrasound today since I will fly out tonight to my grandma’s funeral. Bob has been home burning with a fever all day, so he got to witness the ultrasound remotely for the first time. The connection at the clinic was again spotty. We could see Baby A on the screen, but the screen would freeze. This happened several times then Kenneth, Annie’s husband, found a good spot for the connection. Baby A looked a lot like a baby. I couldn’t hear what the tech was saying because Annie’s youngest son was talking and counting numbers. Eventually the tech started measuring the heart rate and it was such a sweet sound. Bob later said that it sounded like a train going uphill (such a nerd!!!). But he was so delighted to actually hear the heart beat for the first time! This one’s heart rate was 162. Baby B appeared on the screen and was moving his/her arms. The heart rate was 171. The tech suddenly switched the view to 3D. All I could see was some fleshy things that I couldn’t recognize. Kenneth helped by pointing out what was what on the screen. Basically it was Baby A and Baby B’s heads kind of crammed together. It didn’t seem like there was a lot of space in there. Real estate was tight inside Annie’s womb! It was such an amazing and weird thing to see. Later, Annie told me that the tech usually doesn’t do ultrasound this early so she just wanted to see what they’d look like. She said what she had imagined looked better than what they actually looked like, haha. Baby A was measuring 12 weeks 2 days, and Baby B was measuring 12 weeks 5 days. I instantly was worried about Baby A. He/she was measuring 11 weeks 1 day at our last ultrasound. I don’t know if it’s a good thing to be 3 days off. Of course while I was waiting to talk to the OB, I consulted Dr. Goo.gle for margin of errors for these ultrasound measurements. I had to remind myself not to go crazy and just wait for the doctor to tell me. Finally the doctor came on. He said that the pregnancy is progressing well and the babies are measuring well with great heart rates. I asked about the measurement. He said that they are measuring right on target and there is nothing to worry about. There is always a discrepancy on the measurement because of the fetal position and stuff like that. We are measuring well within where they are supposed to be. So I felt very relieved after talking to him. Although we weren’t going to do it, the doctor did ask the tech to measure the nuchal folds of the babies. He said that anything over 3mm would cause some concerns for cardiac development, but our babies both measured at 1mm, which is normal. In terms of my other questions, he said that they’d like to do an ultrasound every four weeks from now on. Bob and I are going to go for the 16 weeks ultrasound. Originally he wasn’t going to do much for that ultrasound in terms of scans. But since Bob is coming, the OB will allow for a vaginal ultrasound with more measurements and we get extra time to talk to the doctor. As for the anatomy scan, we originally scheduled for 19 weeks 5 days. But Annie is going to be out of town. So we may have to push it back to about 21 weeks, which the OB said it’s okay to do. Annie has gained 7 pounds since the last weigh in. The doctor said that the weight gain is good. He does not recommend any other supplements in addition to the vitamins that she’s been taking. He said that for a normal pregnancy with a person without any prior prenatal problems, nothing much is needed as long as the carrier is eating healthy. I asked one final question, about what indicates the need to consult with a high risk OB/maternal-fetal medicine specialist. He said usually with pregnancies that are associated with birth defects. And then he went off on a tangent about an emergency delivery at 25 weeks and we would have to fly Annie over across state line to the next state that prohibits commercial surrogacy because that would be the closest trauma hospital and helicopter wouldn’t fly you to a location six-hour driving distance away within the same state. I mean, the phone connection already wasn’t the best and he said something so scary in response to a question that really didn’t have much to do with his answer. I was panicking a little with the thought of the legal ramification of delivery in a state that does not allow surrogacy. Of course the OB was like, this scenario would very highly unlikely to happen to your situation. I was thinking… why say it???!? Later on Annie told me that this OB likes to give the worst case scenario and then tell you that it probably won’t happen to you and don’t worry about it. But it’s hard not to worry about things when we are so far away, isn’t it? So there it is. Our babies are still there with good heart rates and measurements. Although I didn’t get to attend the ultrasound, my heart is filled with joy that the twins continue to grow. And now I have the newest ultrasound photos to show my paternal grandmother when I share the news with her face-to-face. Off to the airport now. It has been such an emotional roller coaster ride for me. I didn’t sleep that well Sunday night. My mind was a bit unsettled with grandma’s news as well as the scan on Monday. There was no reason for me to be nervous. I had been quite confident that the pregnancy was going well, but my irrational mind would sometimes take over. Sometimes I suddenly had this fear that both babies somehow were no longer there. Annie had been doing very well. She felt a bit yucky for a couple of weeks whenever she ate sweets. If she didn’t eat sweets, then she’d feel fine. She joked that the babies took after me as I don’t eat candy. It is kind of funny to think that way because it’s impossible for them to take after me, the one parent with whom they have no genetic connection. Bob had been also irrationally nervous about the pregnancy especially 1) we were still early in our pregnancy and 2) Annie hadn’t felt a whole lot of symptoms so Bob didn’t get the reassurance that she was still pregnant. We have to keep in mind though that this is somebody who never really felt much sickness during the first trimester for all of her pregnancies. Anyhow, Annie had been very calm and confident that the pregnancy was going well. She is already showing. You could check her out on the page labeled “Gestational Carrier’s Bump Photos” on the left side. 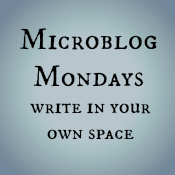 Monday morning, I repeatedly prayed for God’s calmness and peace, as well as my complete trust in Him. Nevertheless, I was still a bit nervous. And I was also mourning the loss of my grandmother as I suddenly teared up in front of my coworker. Gotta love Annie. She is always so on time, or I should say early. Her appointment was at 11am, but I received the payment receipt from the clinic at 10:50am already. At 10:56, my phone rang and it was the video call. Once connected, I could see a wiggly baby on the ultrasound screen! The connection was horrible and the image was all grainy, but it was the most amazing thing I had ever seen! Baby A was moving around on the screen. All I could do was to exclaim at the growth and Baby A’s resemblance to a real baby. When I heard Baby A’s heartbeat for the first time, it was just music to my ears. Although it was delivered on a tiny iPhone screen with exceptionally poor connection, I didn’t care. It was just wonderful to hear how fast it was beating! This baby was moving so much and was so lively that I couldn’t help but guess that this would be the girl! Baby A’s heart rate was 168. Then it was Baby B’s turn. This baby was hiding for a little bit and took a little bit of time to locate. I wasn’t sure what I was seeing, and I was told that the baby was on his/her tummy. The technician shifted the view for a little and went back to Baby B. All of a sudden we saw that the baby flipped! Now he/she was facing up. Both babies were doing acrobatic moves for me! It was just so surreal to see how lively they were at such a young gestational age! Baby B’s heart was beating super fast as well, measuring at 167. While staring at the screen, all I was thinking to myself was I just really wanted to be there physically seeing my babies and witnessing all the scans I could go to so that I wouldn’t be missing anything. It was tough to be so far away. But I am also tremendously grateful for the opportunity to even be “present” this way with the help of technology. I didn’t get to see how big the babies were measuring or what the cervical length was on the video chat. I couldn’t quite hear what was told to me but I gathered someone was going to call me after the appointment. I was feeling relieved and overjoyed that the babies are alive and well, but at the same time I was still a bit unsettled with the uncertainty of the cervical length. I told Bob the good news and both of us were so happy and relieved that both babies are doing well. Annie called me after her appointment and delivered more good news. Baby A was measuring ahead at 11 weeks 1 day. Baby B was right on time at 10 weeks 5 days. Her cervix was 4.1cm long! Praise the Lord! At that point I was completely relieved because I don’t have to worry about the cervix being short and any potential complications that a short cervix may cause, for now. I can at least breathe at this moment. If you are interested, you could click over to the ultrasound photos on the left side. The babies do look like babies now. We will be 11 weeks tomorrow. I still haven’t told my boss. I will tell her after our next scan, which will be in two weeks at 12 weeks 5 days. I am just so incredibly grateful to be at this point. I know we are still early, but as we get to each scan with good news, it has become more and more real that we may just be able to meet our children in about 27 weeks. I can’t even fathom how I will be able to stay calm for the next many months, but I know that I can at least be able to breathe more easily for the next two weeks. We have told a handful of people in real life about our pregnancy. I told my dad right after the second beta, but didn’t tell my mom right away. My mom’s mom is currently very sick in the hospital in Asia so my mom’s sisters flew back there from the states. Because my aunts were around, I didn’t want my mom to share this news with them prematurely. That was the reason why I didn’t want to tell her yet. My dad is very good with keeping secrets so I never worried that he would tell my mom. After our first ultrasound with the confirmation of two babies growing, my mom contacted me regarding adjusting the date of her return to the states. She was originally going to come back in February, but due to my grandma’s situation, she had postponed her return to May. I felt the need to tell her about the babies because I would need my own mother to be around when the babies arrive. I don’t think I need her to take care of the babies, but I would need her to take care of me and my husband so that our house would be at least in a decent state in the first few months of the babies’ lives. So I decided to tell her at about 8 weeks. She was very happy about it and promised me that she’d never tell her sisters until I give her permission. I will have to trust her about that this time. What about Bob’s parents? After our ultrasound at 8 weeks 5 days, Bob and I felt comfortable sharing with his parents. It wouldn’t be hard to share about us expecting two babies but the fact that the pregnancy is via the gift of surrogacy was going to be a bit of a challenge for him. He was brave and took on the task without hesitation. He did it on the day we reached 9 weeks. I was a coward and just stayed in the kitchen area while he and his parents chatted on Sky.pe in our bedroom. My father-in-law was cute. When he found out, he raised both of his arms in victory and celebrated with a big smile on his face. My mother-in-law? I think it probably took her some time to get used to the idea. When Bob made the announcement, she was pleased that we were finally expecting. But she became perplexed and confused about the surrogacy part. She originally thought that the babies would be half caucasian but Bob explained to her several times that these were our embryos, and the carrier is just carrying for us. She then was sad that she couldn’t announce to the whole world that her daughter-in-law was expecting. She was sad that she couldn’t send me Indian sweets that she would’ve sent me if I was pregnant. She mentioned to Bob that Isabelle must have been at least a little bit sad that she couldn’t carry a baby herself. So it was nice that she thought at least a bit about my feelings. She said that she probably wouldn’t say anything to anyone until after the babies are born because I wasn’t carrying. She then said that she still wants the money we send her every year. She was probably afraid that the cost of taking care of newborns was going to eat away part of the money that we give her. She then said that she’d name our babies and to make sure that they marry Hindu Brahmin Iyengar, their caste and subcaste in the Indian caste system. I laughed when Bob told me this comment. Even her son didn’t marry an Indian, let alone the same caste and subcaste. The chances of her grandchildren doing that are slim to none. But it tells you how much our marriage has thrown her world upside down and now she has renewed hope in these children. Anyways, she was a little apprehensive about this news when she heard it. When I first heard about her reaction, I was a little bit disappointed that she wasn’t more excited about our pregnancy because it seemed as though my mother-in-law cared more about the “world’s” opinion of it. It was almost like there was a certain level of shame or stigma attached to us needing to use a surrogate, like I am less than what I am because I couldn’t even carry my own child. But I thought more about it, and realized that this was so out of the left field for her that she probably really needed time to digest the news. Bob chatted with his parents again yesterday. This time it was so much better. I was still a coward and didn’t show my face. But Bob reported that both of his parents are now overjoyed that they will finally have grandchildren to join the family. It seems like my mother-in-law has processed the news. She is now very happy that we have two babies coming. As predicted, she took the credit for our twins as she had prayed to her gods last week at a temple for us to have boy/girl twins. They have been dying to tell people about us expecting but they’ll wait until a month or two from now when we sail into the second trimester. My mother-in-law praised Annie for being so generous, loving, and kind to carry our babies for us, and she also praised me for making a sacrifice for the sake of the health of the babies. It makes me happy that despite the initial reaction, my mother-in-law came around very quickly and is able to fully embrace this news. It’s such a joy to be able to share good news with our families after all these years and for all of our parents to be so happy for us. I just can’t wait until the day they can all meet their grand babies. I hope my in-laws won’t insist on naming our babies. As much as I want them to be part of the babies’ lives, I would want Bob and me to be the ones giving them names since I don’t get the biological connection or the chance to carry them. I hope my in-laws will understand that. I went on an emotional roller coaster ride this whole morning. Annie went in for an ultrasound today. My RE Dr. E also ordered a cervical length check just to be sure. Since I didn’t fly in, we had to rely on Fac.ebook video conferencing for me to be present at the ultrasound. Right at 10am, Annie called me and I could immediately see one of the babies on an abdominal ultrasound. He/She looked so much bigger than the last time I saw him/her. However, the video was cutting in and out because of the poor reception at the office. Later I found out that the heart rates are both at 176. The vaginal ultrasound showed that Baby A was measuring at 8 weeks 4 days and Baby B was at 8 weeks 5 days. I was overjoyed to see them on the screen and to learn about their measurement being on time. Annie asked about the cervical length, which was measuring at 3.4cm. That wasn’t the kind of number that I expected since I knew that anything over 4cm is good. That threw me into panic mode as I couldn’t get an answer from a professional right away. Annie had to wait for her OB to return from a delivery before she could see him. In the mean time, I wrote Dr. E about the cervical length and asked if it would be a cause for concern. She said that she would do a repeat cervical check as she wasn’t sure why her cervix would be 3.4 cm. She asked to have Annie return in a week and it could just be the person measuring. This comment made me so nervous so I asked if this would be a concern and it’s usually the same technician that measures these things. Dr. E responded saying that she wasn’t concerned but if the technician is going to be same, have Annie go see a high-risk OB for the measurement and consider a cerclage if it is still the same. Can you imagine my mind? I couldn’t enjoy the good news of the babies anymore because all my mind was thinking about was short cervix and preterm labor and danger to our babies. It was a very difficult for me to focus on the good news. Luckily I got to talk to the OB. First of all, he was very respectful and patient with my questions. He said that the babies are measuring well with great heartbeats, so that’s great news. In terms of cervical length, he said that 3.4 is really not a concern. Plus it is so early in the pregnancy that it is sometimes hard to see where the uterus ends and where the cervix begins. They usually don’t measure the cervix until much later, and if there is a concern, they don’t do cerclage until 14 weeks. So he doesn’t think that a scan in a week is necessary since it’s so early on. We can remeasure the length in two weeks at our next scan and see what happens. He said that Annie has had three full-term births without any problems. He is not concerned about it. In terms of other things, he said that they won’t push a twin pregnancy beyond 38 weeks. So Annie will get close monitoring once she hits 32 weeks. As of right now, everything is measuring well and I should not be worried. I wrote Dr. E back about Dr. OB’s opinion. She agrees with him about checking in two weeks. I am happy that she agrees with him. And she thinks that it’s actually not hard to measure the cervical length at all but she really thinks that the ultrasound technician might have under-measured it. The thing is, these technicians at an OB office usually don’t measure cervical length at such an early stage. She might not have known how to properly measure it. My trusted OB practice professional Jane told me that she wouldn’t worry about it because it is a hard skill in general and the check is not usually done until later. She said that she wouldn’t even bat an eye if she saw the measurement of 3.4 in a report. When I was waiting to talk with the OB and for Dr. E’s emails, I put my head down and prayed. I prayed for my trust in the Lord since there is really nothing I can do but to trust. I have to trust that if this is God’s will, then I’ll see these babies healthy and alive. But it just shows you how weak our mind is. Even one thing that could be wrong could throw the whole joy out of the window. I need to focus on the great news of the babies. And it also shows that knowing too much and too early may not be a good thing. So I hope that I could keep my peace and calm for the next two weeks. Getting pregnant is so hard, and waiting for the birth is also very hard. There is always something to worry about. But today we celebrate these two lives that are growing well inside of Annie. The pregnancy has been going well as Annie has had symptoms on and off, although it has not been without scares. I had been kind of holding my breath in case of any spotting, and had been feeling fortunate that Annie had not experienced any. So I panicked a little bit when she messaged me about a spotting episode a few days ago. She felt her abdominal area tightening with constant tension, and she spotted with pinkish/brownish discharge. She contacted Dr. E, my RE, who said that it was probably no worries as it might have been stretching of the uterus. As a precaution, she asked Annie to be on an extra dose of progesterone. I emailed Dr. E just to make sure that it was really okay, to which she said that it was from twins, and is very common. Later today Annie will attend our 8 weeks 5 days ultrasound and I will be video conferencing with her at the appointment. 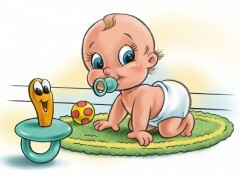 We hope to see some growing and thriving babies. It is at times scary to think about anything bad happening to these babies but I have been telling Bob that we have to put our complete trust in the Lord that He is protecting the babies and Annie. Today, I actually want to write about how loved I have felt from my friends. I have received quite a few gifts in the past two weeks and most of them were surprises. The first one was from my dear friend Jane. She sent us a package a couple of days after our first ultrasound. In it was a card congratulating us as parents-to-be, and completed with one t-shirt for Annie, two onesies for the twins, and two t-shirts for both me and Bob. The t-shirt for Annie says “Their Bun, My Oven” with a picture of an oven and a bun below it. 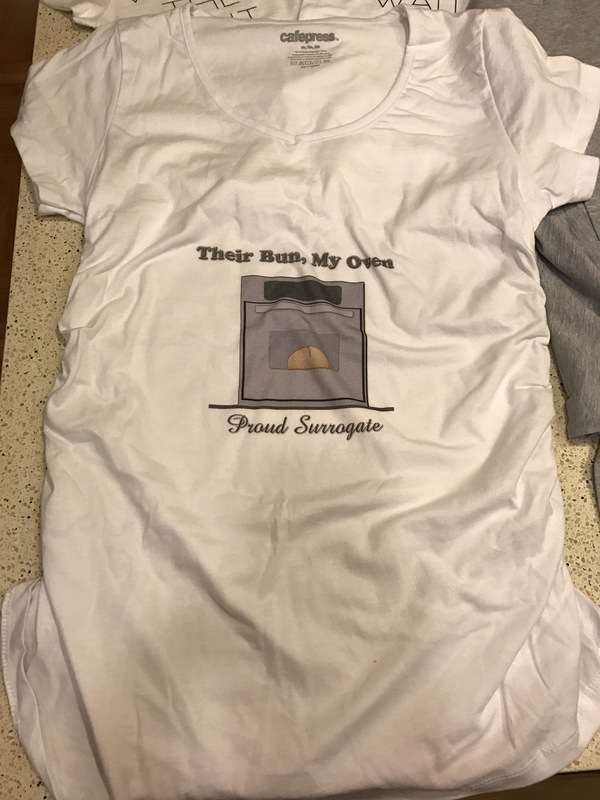 Below the picture it says “Proud Surrogate”. 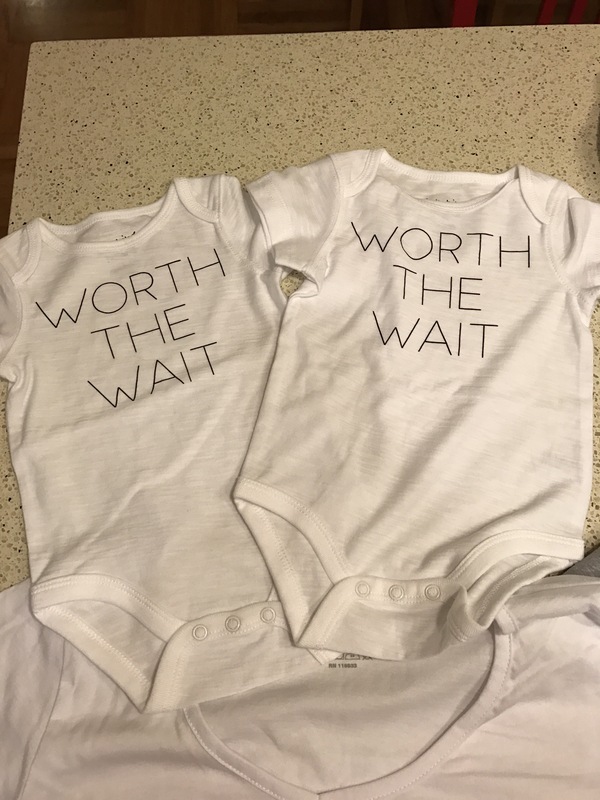 The onesies say “Worth The Wait”. The two t-shirts for us both have the shape of Annie’s state the the words that say “Expecting…. In [Annie’s State]!” (I am not posting Annie’s state because I want to keep it private to protect her identity.) In the package there were also blue and pink lollipops that say “Team Blue” and “Team Pink”. This gift was so thoughtful and came so soon after the ultrasound scan that it brought me to tears. More importantly, it shows the positivity that my friend has in this pregnancy and it touches my heart. Fast forward a week. I was sick at home and the door bell rang. It was our mail lady who delivered a tiny package to my door. I was curious to see what I got since I wasn’t expecting a package. Inside was a necklace with a pendant that is the shape of Annie’s state and a heart that was stamped on the position where Annie’s town is in that state. It was from my other very thoughtful friend Maddie who wrote this: “I thought you might like this since your heart will be in [Annie’s state] for the next 8 months”. This gift is so meaningful and sweet that it made me cry. I don’t know what I have done to deserve such love but I am just so grateful to have these friends who shower me with their love and share my joy of having these babies growing inside Annie. One day I was just wondering aloud to Bob if anyone would go with us to attend the birth and bring the babies home. It would be far away for someone to ride with us or to fly over there. Literally the next day, my friend Jo asked if she could come to photo-document the birth and to help out with the twins. I was so touched by her offer! Only a true friend would make this grand gesture without us even asking! She also gave us a bunch of gifts such as new outfits and onesies and a few boxes of boy/girl baby clothes, items, books, toys, and maternity clothes for Annie. These were quality items of her kids that she had set aside for us. I am just so touched to have friends that are like family, and Jo (and her husband) is definitely one of them. The babies are only a few weeks in gestation but they are already so loved by their aunties. I hope that they will show us some very strong heartbeats on the ultrasound today, and in eight months they will experience the love from these aunties face-to-face. Ever since we started this surrogacy journey, I have experienced a whole gamut of emotions. Of course there are the positive emotions, such as hopefulness, excitement, and gratitude that a person such as my gestational carrier has such compassion for us that she is willing to go through pregnancy for another person. This is sometimes too profound of a concept for me to fathom and to grasp. Every single stage of the journey also invokes fear, worry, and anxiety, such as our donor’s egg retrieval, fertilization rate, number of embryos remaining, potential weather issues, thawing of the embryos, the transfer itself, waiting for beta, and waiting for ultrasound. And then there is this deeper emotion of joy that is much greater than the temporary feeling of happiness. This joy that comes from witnessing the miracle of life that is growing inside of our gestational carrier and from the hope and the promising future of our children being born into this world and meeting us face-to-face. What surprised me was the sense of loss that I felt during our epic first ultrasound while experiencing this tremendous joy of seeing the two heartbeats that were flickering on the screen. I didn’t know that those two complex emotions could exist in the same moment, but they did, because I experienced them. Seeing those two heartbeats was one of the most exhilarating and monumental moments in my life. The tears that were shed were definitely tears of joy. However, seeing Annie’s name on the screen and the ultrasound photos brought me back to the reality of what my body will likely not ever be able to accomplish. It was supposed to be my name and my date of birth printed on the photos. If I could have my way, it was also supposed to be my eggs, my uterus, and my pregnancy five years ago. While being super excited and joyful and amazed, I was at the same time tremendously sad. But I believe that God’s plan for us is perfect in every way and His ways are higher than our ways (Isaiah 55:8-9). I believe that this is what needs to happen for us to have our babies. And I fully embrace that. But it does not mean that I will not continue to have a sense of loss that I have to grieve. What I need to do is to continue to process my feelings with the help of my therapist. And I did exactly that. My visit to my therapist was highly emotionally charged. It was just so exciting to be able to finally share good news with her after having to tell her heartbreaking news over and over again in the past two and a half years. But at the same time, my biggest need was to process my grief and sadness with her. I even cried when I was telling her that. I knew that sadness and joy could exist simultaneously but it was reassuring for a professional to confirm it with me. She told me that it is very common for intended mother to feel a sense of loss while expecting via a surrogate, especially when the surrogate starts to feel the baby or babies. There is the loss of the sense of control because it is not my own body. There is nothing wrong with these feelings. It is just part of my reality. I told her sometimes I don’t know how to feel. And she said that it is okay to not know how to feel. She said that as the pregnancy progresses, I may find myself feeling jealous, annoyed, or frustrated with Annie. But at the same time, I would continue to feel grateful, joyful, and excited. The key is to feel all that I need to feel and to tell myself that it is okay to do so. She has heard enough from intended mothers about these feelings, but she kind of experienced it first hand when one of her best friends was expecting via surrogacy. The second and third trimesters were kind of difficult for her friend. And I am sure that it will be similar for me. I don’t know if this sense of loss and the grief will ever completely go away but maybe it will diminish with the birth of the babies. In terms of my fear that something bad may happen to the pregnancy, my therapist reminded me that I have lived in the unknown in the past few years. Treat this the same way. Embrace the unknown. Whenever I find myself having these thoughts, ask myself if they are helpful. If they are not, acknowledge them and then let go. And if anything bad were to happen, I would be able to deal with it just like how I have been dealing with bad news in the past few years. One interesting thing is that, ever since the news of us expecting twins, my attitude towards pregnant women has changed for the better. It has been easier for me to chat with my pregnant coworker. It has even been easier for me to accept pregnancy announcements. It is quite eye-opening for myself to see the immediate change in my thoughts and feelings. I know that the sting of infertility doesn’t totally go away, but it’s surprising for me to be able to feel more positive or at ease with other people’s pregnancy in such a short amount of time. What I am trying to say is, our pregnancy is not always going to make us feel positive and excited. There are also fear, worry, jealousy, sadness, and anxiety. But having these feelings doesn’t mean that we are ungrateful about where we are now. The reality is, we are human beings and have complicated emotions. The key to maintain emotional health is to address these feelings rather than brushing them aside so that we are ready to welcome the babies in every way possible when the time comes.